In the mid 1920s, R. W. Johnson, of the Johnson & Johnson company, U.S.A., asked efficiency expert Dr. Lillian Gilbreth to find out what women liked and disliked about menstrual pads, belts, and the various menstrual underwear available, and gather information to make the One Best Pad. Later, Gilbreth became known as "the mother of modern management" as well as of twelve children (read her biography) sired by her husband, Frank, likewise an efficiency expert, who died in 1924. Some of the children wrote the popular books Cheaper by the Dozen and Belles on Their Toes about their childhood with famous - and efficient - parents. Hollywood made movies of the books in the late 1940s and early 1950s. In the mid 1920s American women used Kotex pads far more than any other commercial napkin - commercial tampons didn't appear until the early 1930s, and menstrual cups probably in the 1930s - and Johnson wanted to find out why. His own brands, Lister's, Nupak and Modess, competed with dozens of brands for the rest of the market. 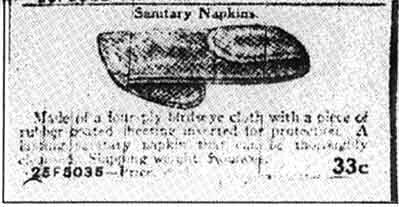 The ad text, above, reads, "Made of a four-ply birdseye cloth with a piece of rubber sheeting inserted for protection. A lasting sanitary napkin that can be thoroughly cleaned. Shipping weight, 5 ounces." Women had often made their own pads from birdseye cloth, also used for children's diapers. Gilbreth gave questionnaires to college students, including some at Smith, Wellesley, New Jersey College for Women, Antioch, as well as to some business women and high school girls, and got back 1037 out of 2543 distributed. She asked them about their napkin and belt practices, including whether or not they altered the pads, why and how, before wearing them; how many they used; where they bought them; etc. The respondents wrote what they liked and disliked about products and suggested improvements. I will cover a few topics of the report, and give her conclusions and recommendations, many of which are valid today. In sum, the 134-page typewritten report, with tables of statistics but no illustrations, constitutes probably the first formal analysis of women's attitudes about menstrual products. Up to that point, manufacturers seemed to base their pads and belts on nineteenth-century products - and their intuition. Lillian Gilbreth and Johnson & Johnson changed that.